I went batty for this set when I saw it! I just knew it would look awesome embossed on black card stock. I did some sanding on both my Black cardstock as well as the Honey 2.5" circle before doing the embossing. The bat on the circle has two of the tiny sparkles for eerie glowing eyes - ooooohhhhh (said in a spooky voice)! 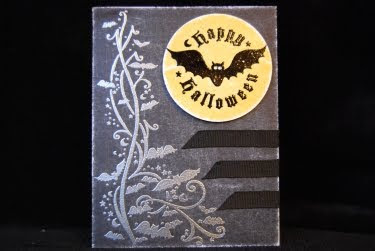 The "flight" of bats looks really great with the silver embossing.